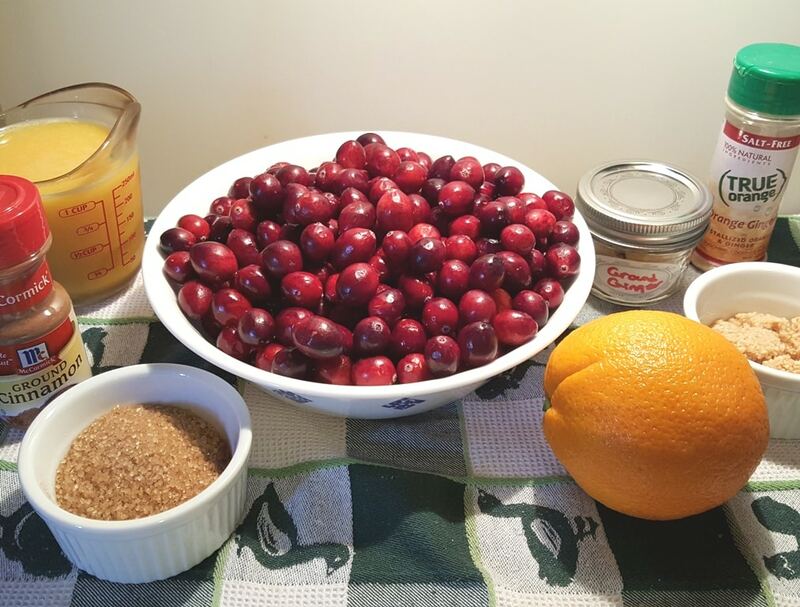 Thanksgiving would not be the same without Instant Pot Orange Ginger Cranberry Sauce in the pressure cooker. You will never open another can again! So, the Holidays are coming up and I love to do lots of cooking and have lots of friends around. We prefer our Instant Pot Orange Ginger Cranberry Sauce somewhere between chunky pieces and completely jelled. My Holiday menu is always filled with at least six different dishes. Some are the traditional ones I do each year and others are more exotic. The Instant Pot or Pressure Cooker helps to make Thanksgiving so much easier. I used to do my Cranberry Sauce on the stove or in my slow cooker and find it easier and quicker in the Instant Pot or Pressure Cooker. It nicely frees up my 2 Quart Slow Cooker for my delicious Slow Cooker Holiday Corny Cornbread. You have some options here. You can use freshly grated ginger, or even ground ginger, if you like. If I don’t have fresh ginger on hand, I prefer to use True Orange Ginger. It tastes like freshly picked oranges and freshly grated ginger. A small amount, gives a great pop of flavor. This makes a lot of Instant Pot Orange Ginger Cranberry Sauce, so here is a great idea for leftovers. Perfect for the next morning is my Pressure Cooker Orange Cranberry French Toast. 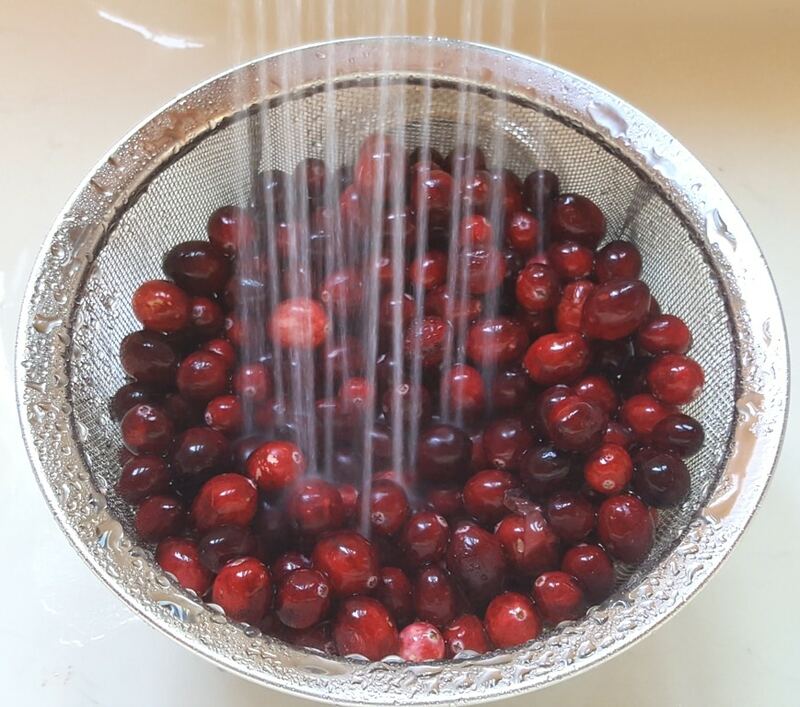 Using a Strainer Basket, rinse the Cranberries very well and pick out anything that doesn’t belong. Set aside the Cranberries to drain. As I mentioned above, the True Orange Ginger gives a wonderfully strong pop of orange and ginger. Because I like even more orange, instead of using fresh orange juice, I like to use frozen concentrate and add make a stronger cup of orange juice. 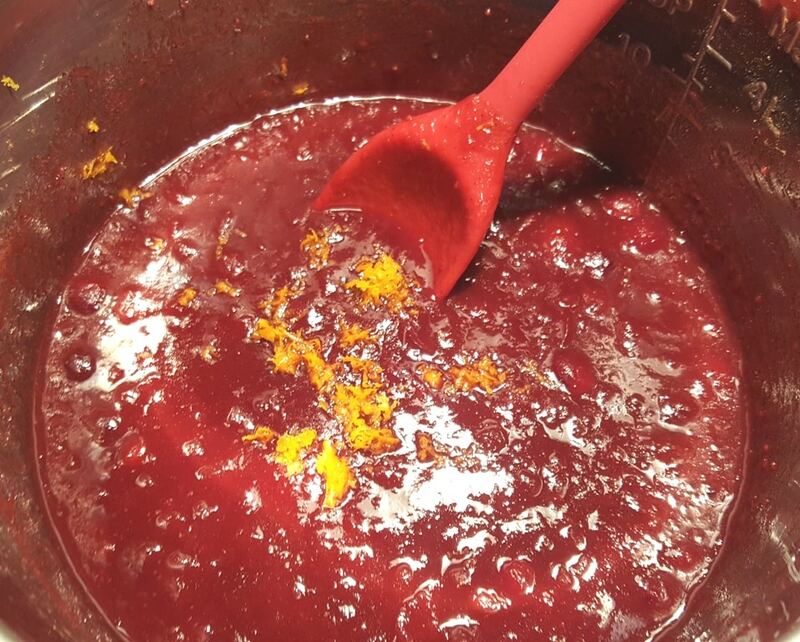 I like my Instant Pot Orange Ginger Cranberry Sauce Sauce very fragrant and orangey. If you don’t like the taste of ginger, just skip it. To your Measuring Cup, add the frozen concentrate and fresh water. 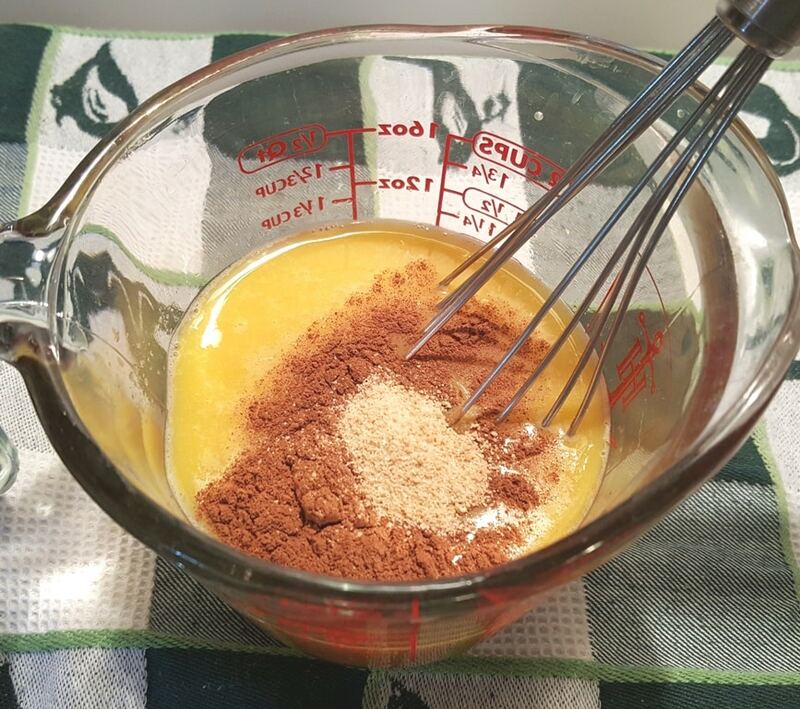 Add the Demerara Sugar, Ground Cinnamon and True Orange Ginger to the orange juice and Whisk together well. 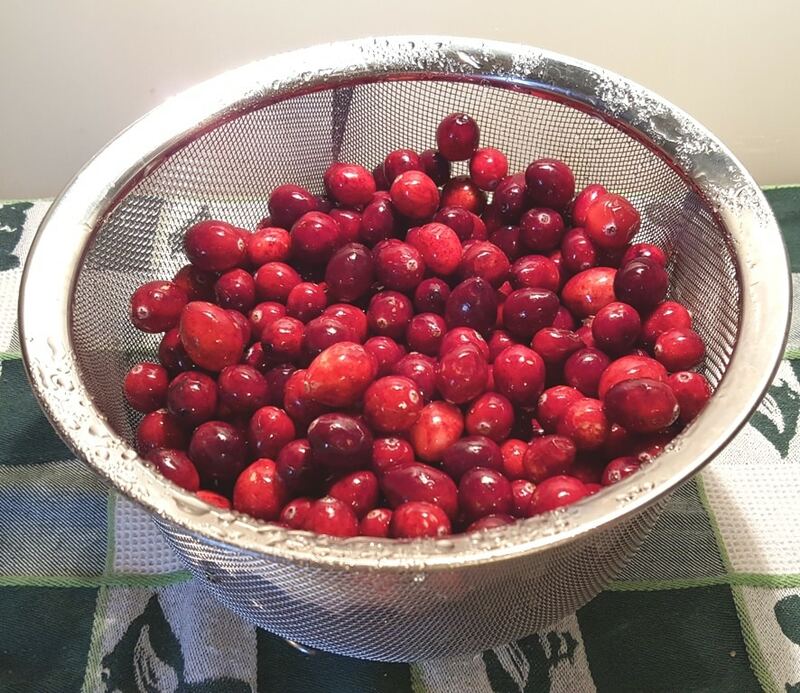 Dump the Cranberries into the Instant Pot or Pressure Cooker cooking pot. 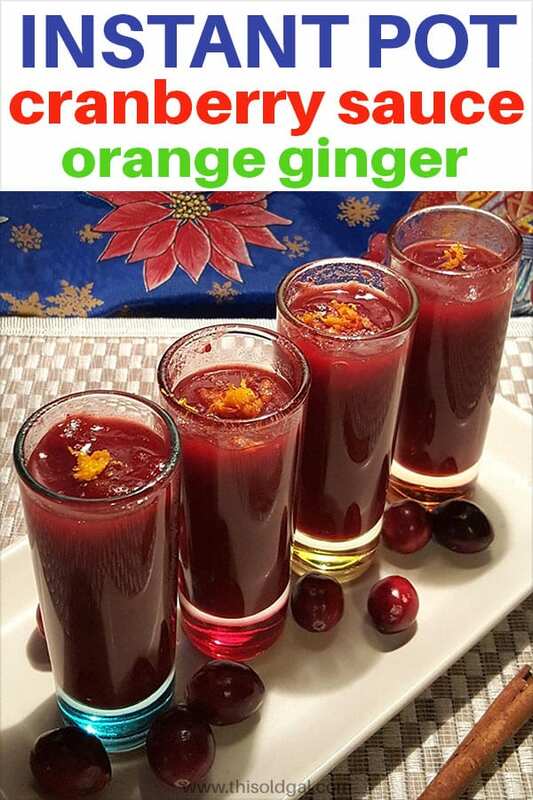 Pour the Orange Ginger Juice over the Cranberries and mix through. 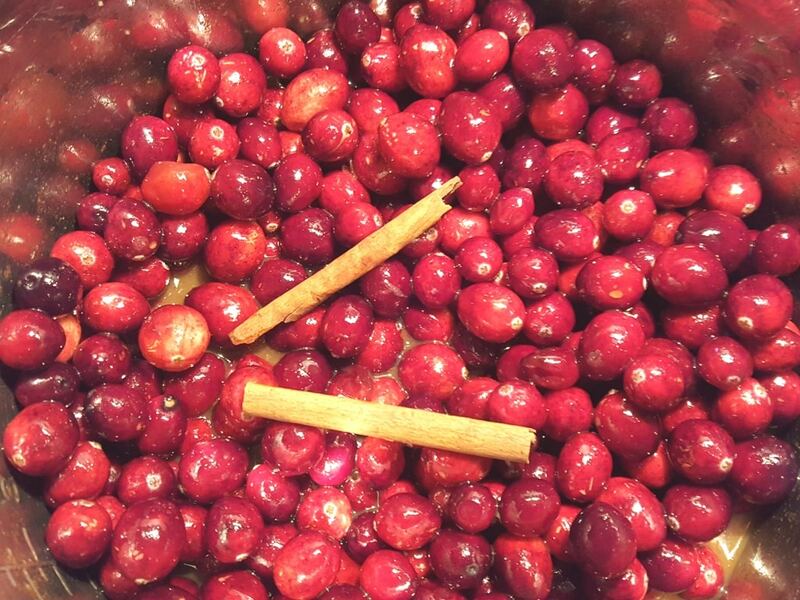 Even though ground cinnamon was added, I like to add Whole Cinnamon Sticks to the Cranberries. It just seems more festive and I really like the taste. I made a double batch, so I used two Cinnamon Sticks. As I said, we like the Cranberries broken down, but not to the point of complete liquid. 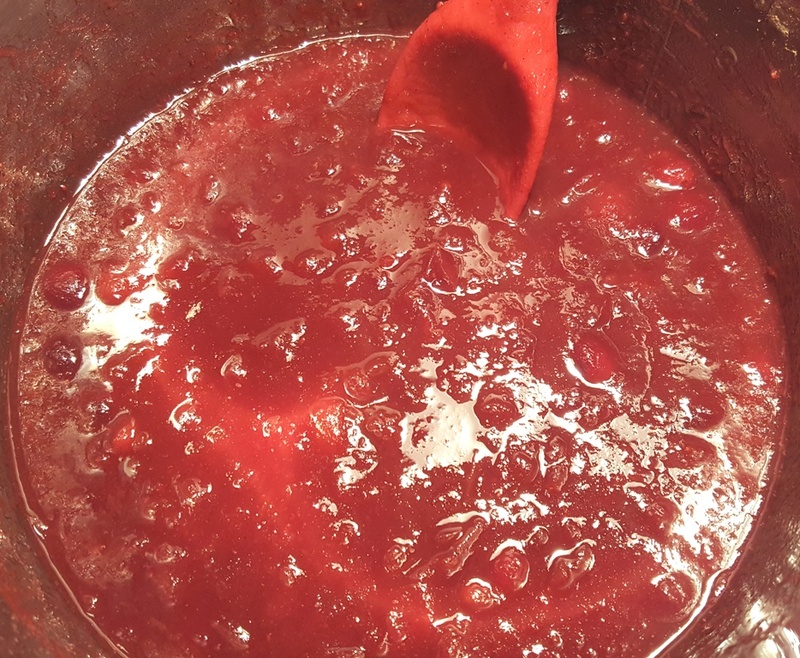 The Instant Pot Orange Ginger Cranberry Sauce will thicken up a bit, when cooled..
For another pop of flavor, I like to add Orange Zest after the Cranberries have been cooked. 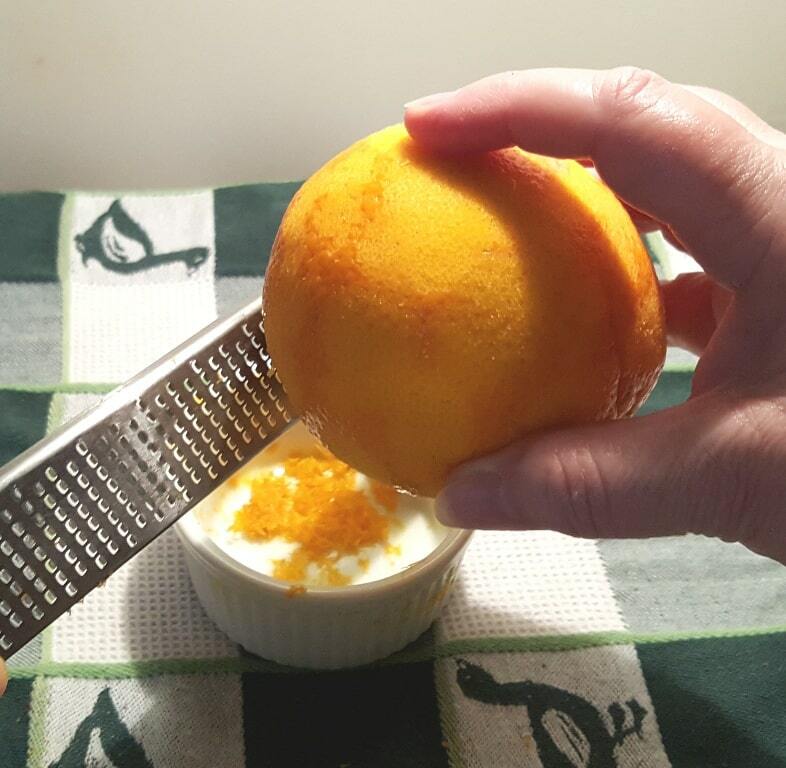 When you use your Microplane Stainless Steel Zester to Zest the Orange, make sure you don’t get any of the pith, the white part. That is the bitter part. 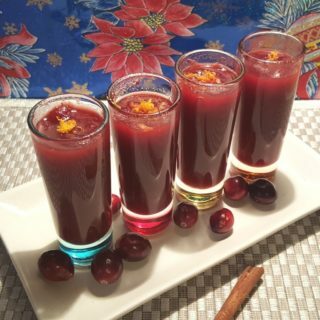 The Instant Pot Orange Ginger Cranberry Sauce freezes really well. 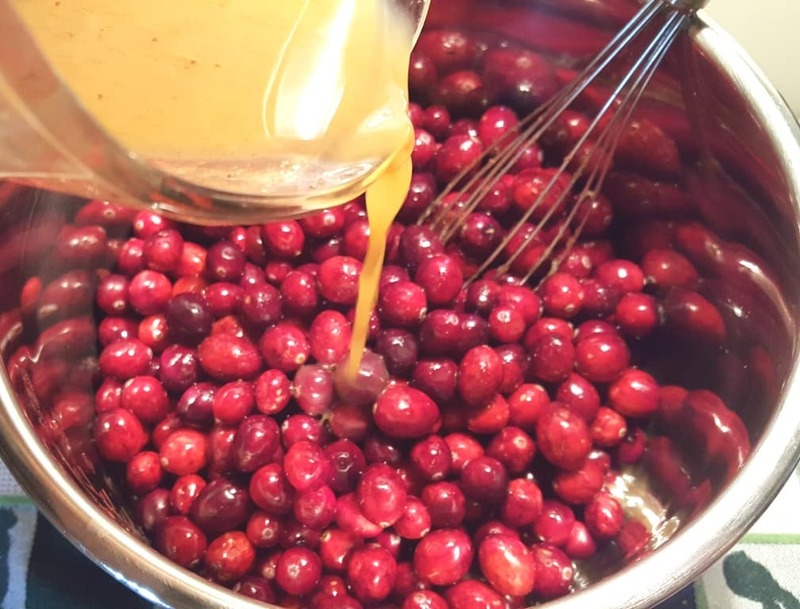 I always make a double batch right before Thanksgiving and use my Foodsaver Vaccum Sealer, to store the rest of the Cranberry Sauce for the rest of the Holidays. We have two religions in this house, so we get to do the Jewish Holidays and the Catholic/Christian Holidays. This means, lots of partying and lots of cooking and lots of fun. We like to serve each guest with their own Chilled Shot Glass. It looks so pretty and always starts conversation. Actually, it is less messy than passing around the bowl of Cranberry Sauce. Each guest can just pour out the sauce right onto their plate. Of course, we have a bigger bowl of sauce as well, for those who like a larger serving. More Instant Pot Cranberry Recipes to Make. Pressure Cooker Holiday Corny Cornbread is always a hit at Thanksgiving and Christmas. Pressure Cooker Orange Cranberry French Toast for breakfast. 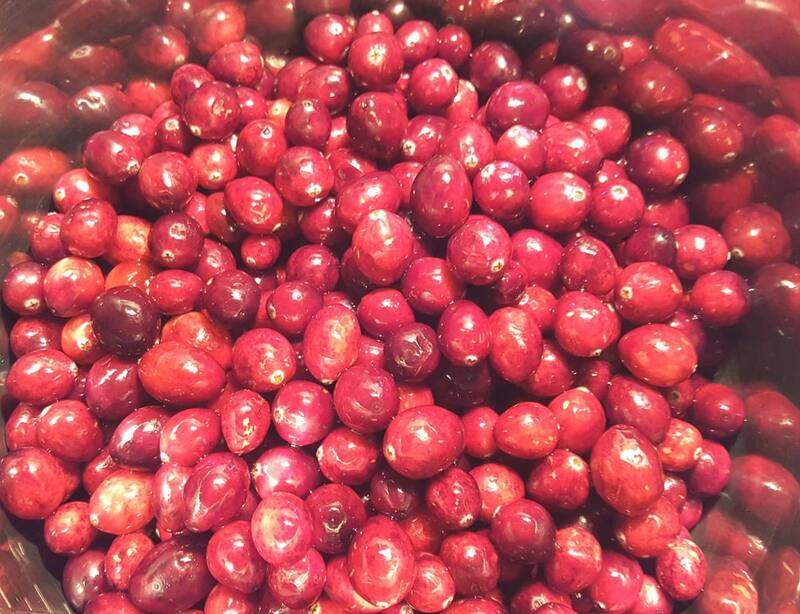 Rinse and drain cranberries and set aside. Whisk together orange juice, sugar, cinnamon and True Orange Ginger (or grated ginger). Add cranberries and juice to the Pressure Cooker cooking pot. Add cinnamon stick. Lock on lid and close pressure valve. Cook at High pressure for 1 minute. When Beep sounds, wait 5 minutes and then release the rest of the pressure. Open lid and add Orange Zest. The longer you cook, the more the cranberries break a part. To keep them relatively whole, cook for 1 minute. For a more sauce like consistency, cook for 4 minutes. Maple Syrup or White Sugar can be used in place of Demerara Sugar. 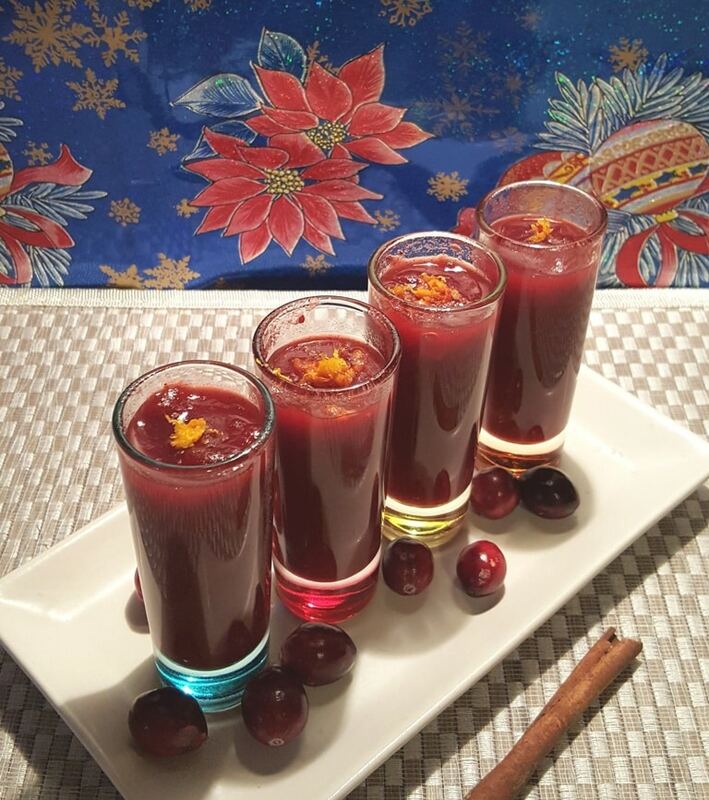 PIN this Instant Pot Orange Ginger Cranberry Sauce! I laughed so hard, I almost choked! Jill, I can’t buy the orange/ginger seasoning where I live (Mexico), so what do you think about adding candied ginger, chopped very fine? I’ll also use freshly squeezed orange juice. Thanks! I can’t find fresh Cranberries. Can I use frozen? If so, what would I do differently? I wanted to make this and your French toast for breakfast. 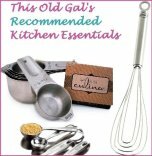 I have made several of your recipes and we have enjoyed all of them. Cook on high pressure for HOW MANY minutes? Notes say “cook for 5-7 minutes. For a more sauce like consistency, cook for 8 minutes.” but instructions say 15 hp and 5 npr. Is the note referring to the npr?